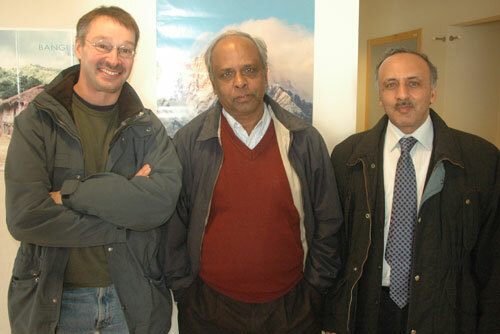 The project partners, from left to right Dr. Ebbe Nordlander, Professor Shariff Enamur Kabir and Professor Pradeep Mathur visiting SASNET’s root node office during a project planning meeting in Lund in March 2009. 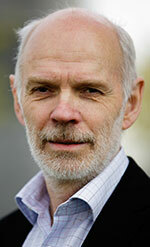 Ebbe Nordlander has been involved in research collaboration with partners in India and Bangladesh since many years. A key collaboration partner is Prof. Shariff Enamul Kabir at Jahangirnagar University in Savar, Bangladesh. For some years he was the Vice Chancellor of the university. He is still affiliated to Jahangirnagar doing research, but otherwise he has moved to a new position at the Bangladesh Public Service Commission. Their collaboration has been active from 2004-06, when Nordlander was involved in a Swedish Research Links programme with the Department of Chemistry at Jahangirnagar University in Savar, Bangladesh. The project was entitled ”Applications of organometallic complexes in catalysis and organic synthesis”. In August 2008, Professor Nordlander was awarded a SASNET planning grant for a research projet titled ”Modelling of hydrodesulfurization reactions and development of new molecular hydrodesulfurization catalyst”. The project was carried out in collaboration with Professor Kabir at at Jahangirnagar University, and Professor Pradeep Mathur, Director for the Indian Institute of Technology (IIT) Indore, India – previously at the Dept. of Chemistry, IIT Mumbai. Project abstract: The collaborators aimed to establish a network where the reaction mechanisms of the industrially and environmentally important hydrodesulfurization process (the removal of sulfur from fossil fuels, e.g. oil) were studied on metal complexes that function as models for industrial hydrodesulfurization catalysts. In addition, attempts were made to develop new clean and effective hydrodesulfurization catalysts. The understanding and improvement of the hydrodesulfurization process constitutes an important academic and practical goal. Read the project report. The collaboration between Lund University and Jahangirnagar continues. In May-June 2014, Professor Kabir visits Sweden in order to plan for new projects focusing on hydrodesulfurization catalysts. 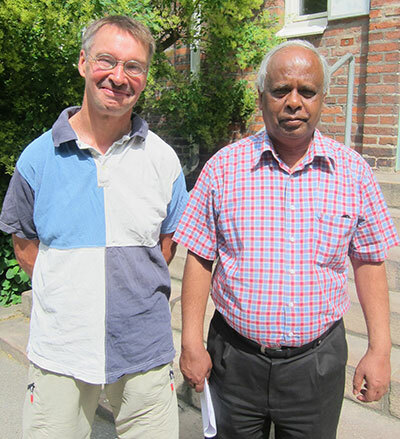 On 10 June 2014, Shariff Enamul Kabir visited SASNET’s ofice along with Ebbe Nordlander and updated Lars Eklund on their plans (photo from their visit). South Asian PhD candidates at the department, funded by Erasmus Mundus mobility programme scholarships – see below– are also involved in the research projects. Another key collaboration partner of Prof. Ebbe Nordlander is Professor Rabindranath Mukherjee (photo to the left), previously at the Indian Institute of Technology (IIT) Kanpur, but currently Director for the prestigeous Indian Institute for Science Education and Research (IISER) in Kolkata. 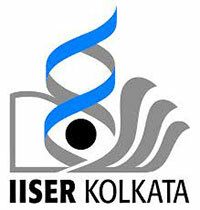 In 2013, the Science Faculty at Lund University signed an MoU with IISER Kolkata. The Indian Institutes of Science Education and Research (IISERs), and the related National Institute of Science Education and Research (NISER) are a group of premier science education and research institutes in India. They were created by the Government of India, through the Ministry of Human Resource Development (MHRD), under The National Institutes of Technology (Amendment) Bill, 2010. Five IISERs have been established across the country, namely IISER Kolkata in West Bengal, IISER Pune in Maharashtra, IISER Mohali in Punjab, IISER Bhopal in Madhya Pradesh and IISER Thiruvananthapuram in Kerala. In December 2014, Prof. Ebbe Nordlander was granted a special one month position at SASNET, a position dedicated to write a research application with a South Asia focus (”ansökningsmånad” in Swedish). SASNET introduced this offer as a new scheme in 2014 to promote more South Asia related research at Lund University. Researchers from all faculties and all disciplines within Lund university were eligible to apply. Prof. Nordlander planned to write a research application to the Swedish Research Council for a project to be developed in collaboration with Associate Professor Tapan Kanti Paine (photo) at the Indian Association for the Cultivation of Science in Kolkata, India. The project relates to the development of new metal complexes that can act as catalysts for reactions in which hydrocarbons obtained one or more oxygen atoms (a catalyst is a substance or compound that can accelerate a chemical reaction without itself consumed in the reaction). More information. The application was successful. On 3 November 2015, the Swedish Research Council decided to award the project, entitled ”Development of bio-inspired catalysts for oxidative degradation of organic pollutants in wastewater” SEK 1.17 m for three years (2016-18) as a Swedish Research Links (SRL) grant. The project is coordinated by Ebbe Nordlander on the Swedish side, and Tapan Kanti on the Indian side. More information about the South Asia related SRL grants 2015. From left to right: Prof. Saroj Kanti Singh, Prof. Topashi Ghosh Roy, Lars Eklund, Prof. Monir Udin, Prof. Ebbe Nordlander, and PhD candidate Ahibur Rahaman (at the Dept. of Chemical Physics). 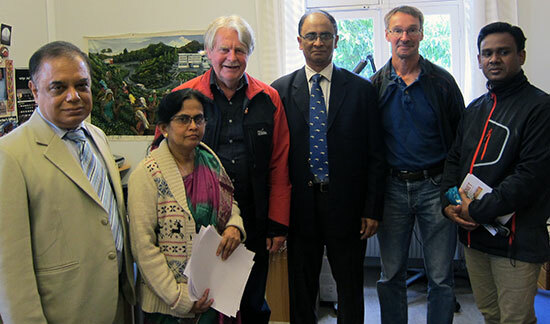 In early September 2015, a three-member academic delegation from Chittagong, Bangladesh, visited Lund University in order to meet with Prof. Ebbe Nordlander at the Dept. of Chemical Physics, and discuss plans for new collaborative research projects. The delegation consisted of Professors Monir Uddin and Topashi Ghosh Roy from the Department of Chemistry, University of Chittagong; and Prof. Saroj Kanti Singh, retired Professor from from Chittagong University (but now Vice Chancellor at BGC Trust University Bangladesh, based in Chittagong). The objective of the Lund visit was to explore possibilities to develop a project focusing on enriching teaching-learning methods and facilities in the Dept. of Chemistry at University of Chittagong. This initiative is suppported by the Government of Bangladesh through its Higher Education Quality Enhancement Project (HEQEP). The delegation also visited SASNET’s office in Lund, and met deputy director Lars Eklund. See photo. Professor Villy Sundström is involved in a research collaboration project on ”Control of TiO2 Nanoparticle Morphology for Optimization of Electron Injection, Recombination and Charge Transport in Dye-Sensitized Solar Cells” with the Department of Chemistry at University of Kalyani, West Bengal, India. In November 2008 this joint project was given SEK 600 000 as a three-year grant for the period 2009–11 from the Swedish Research Links programme (funded by Sida and the Swedish Research Council). The collaboration partner on the Indian side is Dr. (Ms.) Swati De, Associate Professor at the Dept. of Chemistry at University of Kalyani. More information on the Swedish Research Links grants 2008. Project abstract: The aim of this project was to prepare and characterize TiO_2 nanoparticles of various shapes and sizes and to further use them for preparation of nanostructured films with adsorbed dyes. Photoinduced electron transfer processes in sensitized films and functioning solar cells will be studied using time-resolved spectroscopy. This project had its emphasis on the structure determining factors of the individual TiO_2 nanoparticles. We will focuss on how the nanoparticle preparation methods, their sizes and shapes influence the electron injection and recombination dynamics in the dye-sensitized solar cell (DSSC) films and solar cells. The aim was to understand how we can achieve more efficient DSSC’s by controlling the semiconductor properties i.e. size, shape, surface defects of the TiO_2 nanoparticles that constitute the semiconductor phase. The department has had South Asian research collaboration projects running for many years, and housed a large number of students, PhD candidates and post-docs from India, Pakistan and Bangladesh – see below. The leading person behind these efforts is Professor Ebbe Nordlander, but Professor Villy Sundström has also been involved. A large number of Indian students, PhD candidates, post-docs and academic staff has come to Lund University from the academic year 2009-10 and onwards, as scholarship holders through a number of Erasmus Mundus External Cooperation Window mobility programmes being coordinated by Lund University. The first programme was an India lot announced in 2008, where out of a total mobility of 320 persons, 53 Indian students, researchers and academic staff were selected to come specically to Lund University. More information about the EMECW programme lot 15. Two Indian researchers were selected by the EMECW lot 15 consortium stayed at the Division of Chemical Physics, Lund University: PhD candidate Biswanath Das (photo to the left) from Viswa Bharati University in Shantiniketan, West Bengal, and later Indian Institute of Technology Kanpur (IITK); and Dr. Manjula Patil from Karnataka University in Dharwar. After defending his PhD thesis, Dr. Biswanath Das is now working as a post-doc at Uppsala University within the Department of Chemistry, Ångström Laboratory. 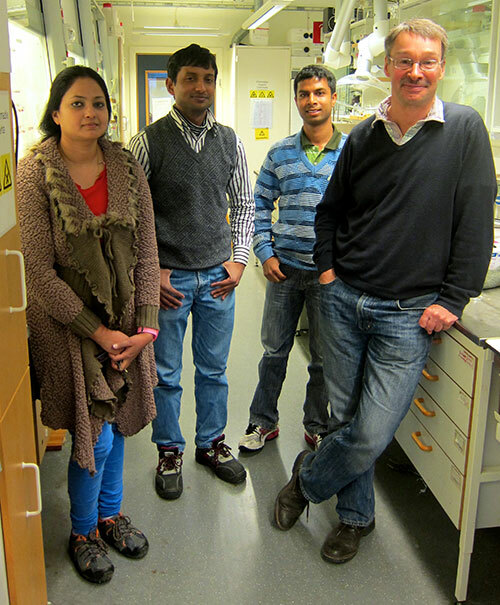 Professor Ebbe Nordlander with three of the four South Asian PhD candidates he is supervising at the department in February 2014. From left Amber Ata, Kamal Hossain and Mainak Mitra. Ahibur Rahaman was in Bangladesh at the time of SASNET’s visit. Under the Erasmus Mundus India programme lot for the following year 2010-11 another two Indian researchers came to the department, namely PhD candidate Mainak Mitra from IIT Kanpur; and Dr. Reena Singh from Jadavpur University, Kolkata. Dr Sony George, Lecturer at the Department of Chemistry, University of Kerala in Thiruvananthapuram, spent two months (September–October 2010) as an Erasmus Mundus scholarship holder in the capacity as academic staff. At the Division of Chemical Physics, he was hosted by Prof. Villy Sundström. During the following years, Lund University hosted an Erasmus Mundus Asia Regional lot programme involving universities in Pakistan, Bangladesh, Nepal and India. In 2013 came to the department PhD candidate Kamal Hossain from Jahangirnagar University, Bangladesh; PhD candidate Ahibur Rahaman, also from from Jahangirnagar University; and PhD candidate Amber Ata from University of Karachi. Kamal Hossain is working on a research project entitled ”Synthesis and Reactivity Studies of Model Complexes for Molybdenum and Tungsten containing Oxtotransferase Enzymes”. Amber Ata is working on a research project entitled ”Synthesis and Reactivity of Vanadium Complexes, some Iron and Molybdenum containing related complexes”. Mainak Mitra is working on a research project entitled ”Synthtic Modelling of Non-Heme Fe-Oxygenases”. Two new PhD candidates from South Asia work at the department in 2014, Arun Kumar Raha and Satish Bhat.